Important clinical issues as the outcome of long term treatment with antidepressants, the time of onset of the antidepressant response and the limitations of the antidepressants currently available are covered in this monograph. Leading researchers in the area of clinical and experimental psychopharmacology critically assess the progress in their specialist fields. The mechanisms of action of antidepressants are considered, followed by clinical research into the role of the hypothalamic-pituitary-adrenal axis and the immune system in the biology of depression and in response to treatment. The final chapter deals with the important chemical entities now undergoing development as antidepressants. 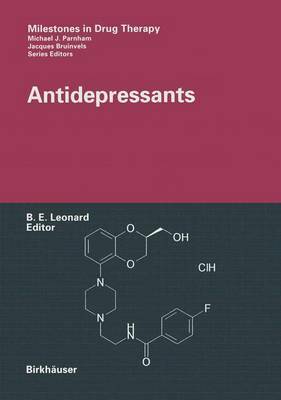 The purpose of this monograph is not only to inform but also to stimulate research into the biology of depression and the mechanisms behind the action of effective antidepressants. This monograph is of interest to psychiatrists, psychologists, pharmacologists, neuroscientists and endocrinologists.